I wish I would have found this link-up sooner! 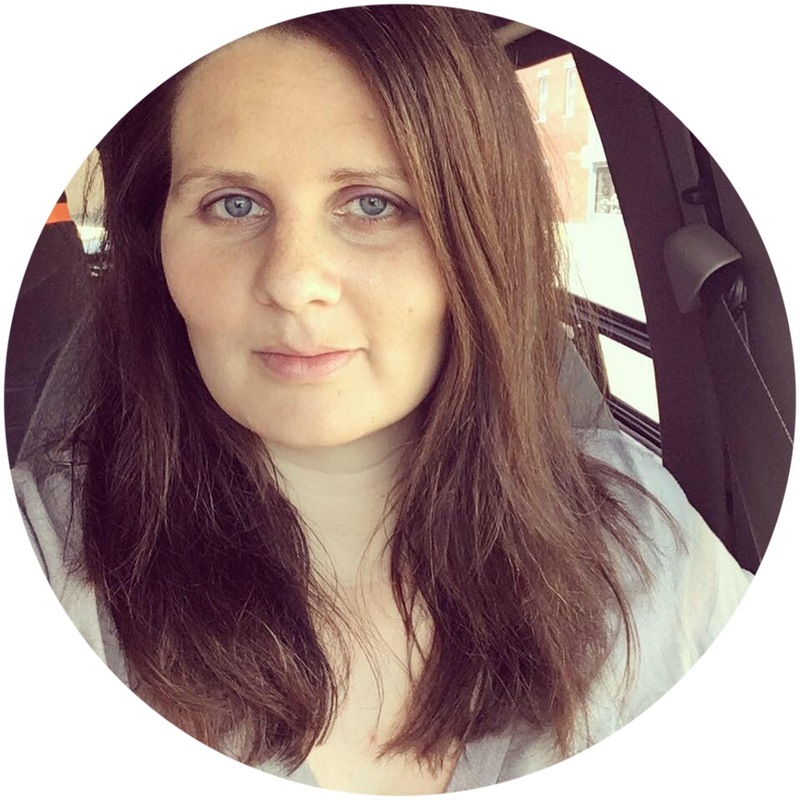 I found Sarah through the The Old Schoolhouse Crew and while perusing her blog I found out that she has been hosting this super adorable pregnancy link-up. So even though I haven't been doing very regular updates like this, I'm joining in now for these last few months! 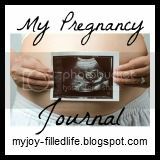 For any new blog readers: this is my third pregnancy. I have a seven year old son and three year old daughter, and am having a boy this time. My due date is February 7th. How far along are you? Just flipped over to 30 weeks on Thursday, 11/29! Best Moment this week? Drumming lightly on my tummy and getting a kick back in response. That never gets old! Prayer requests? For my emotions. I know I have raised my voice with the kids too much this week and that I've gotten upset over silly things. The kids have been acting up a lot and trying my patience but that doesn't mean that I need to respond in anger and yelling. Symptoms? Some heartburn here and there. Some trouble sleeping and lots of up & down mood swings. I've also noticed a bit more difficulty when trying to do certain things, like tying my shoes or certain chores. Other than that I feel great! Weight gain (or loss)? 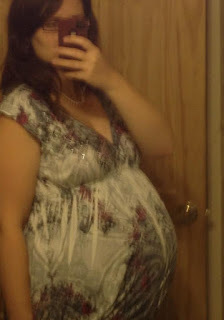 Since my last midwife visit I think I've gained 2-3 pounds. We'll find out for sure Friday. Cravings? Cookies! A couple friends and I are going to have a cookie exchange soon and I can't wait. :) Oh and also fruit snacks - specifically Gushers or Fruit Roll Ups. Food Aversions? I made a super delicious pot roast in the crock pot for dinner one night this past week and then at dinner time did not want to eat any of it. Sigh. I did eat a little though. What Made Me Cry This Week? Ummm, "what didn't make me cry this week" would probably be a more appropriate question...I've been pretty emotional. Sleep? Meh. I've been SUPER awake at night. Early to mid afternoon I start to get VERY sleepy and have actually been taking the occasional cat nap with Ellie on the couch. Stretch Marks? Umm...yes. I've had them since the first babe, unfortunately! They've faded somewhat with time, though. And they don't seem to be growing as much this time around. Movement? Lots. Especially late at night when I'm trying to sleep and after I eat - little flips and kicks like he's trying to get comfy. What I miss.... Being able to throw on clothes and go. Now I have to examine everything to make sure it's fitting right, that my stomach is covered, etc. What I'm looking forward to.... Preparing more for our homebirth. Although we know that's what we're doing I still have a birth kit to buy and other supplies to start getting ready. I need to find who can watch the kids if needed and I'd like to make up some freezer meals so I won't have to cook as much right after he's born - try to get some of the planning done. Labor Signs? No, thank goodness! 1. We went to church this morning and the pastor's sermon really made me think - he talked about how we should take a "holiday" this Christmas season from the conflicts & things that cause us strife. Instead of lashing out when people say hurtful things - which is usually our immediate reaction - we should just be polite, change the subject, etc. Instead of worrying, fretting, and getting involved in family drama or petty quarrels, we should focus on the real reason for the season. 2. Several people at church told me how good and healthy I looked. I also posted a belly photo to Facebook today (after much deliberation) and my friends immediately started commenting with lovely, excited comments - no negativity. I am very blessed with people (in real life and online) who support me. Instead of focusing on the very few negative people, I'm going to instead choose to enjoy this pregnancy & the positive people who support me. Something I'm Excited About.... How excited the kids are. They're really loving feeling the baby kick and telling me all the different things they're going to teach him. I know we may have some issues but I hope they'll be minor - I really tried to talk up Ellie to Zeke before she was born and he really only had a tiny bit of jealousy when she was born. Their excitement and willingness to help makes me very happy. Hi! Thanks so much for popping by and leaving a message! You look great and I'm envious your in the last 10 weeks! Oh well, I'm only 3 weeks behind - ish :) I'm feeling emotional too, so I feel for you. Hang in there sister! Shay - I'm so glad you linked up! I enjoyed reading your pregnancy update. I have been on that emotional roller coaster too. Having very little patience with the kids and raising my voice a little too much, and dealing with some difficult family members as well. I like the scripture you shared and the teaching from your pastor; thanks for sharing that. Will this be your first homebirth? Thank you for stopping by and for the prayers! :) This will be my first homebirth - I'm pretty excited about it. Enjoyed reading your update. Stopping by from the TOS blog linky. Now following you!